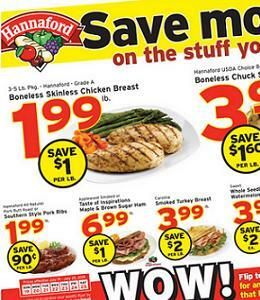 Hannaford Weekly Ad Circular, valid April 21 – April 27, 2019. This Week Hannaford Flyer best deals, and grocery savings on: Southern Style Pork Ribs; Whole Seedless Watermelon; Geaorgia Peaches; Boneless Strip Steak; Grass Fed Top Sirloin Steak; Nectarines or Peaches; Land O Lakes American Cheese; Bantry Bay Mussels in Sauce; Hannaford Italian Sausage; Imported Polish Ham; Fresh Boneless Atlantic Salmon Fillets; Hood Ice Cream; Kraft American Singles; Betty Crocker Suddenly Salad; Dannon Activia Yogurt; Minute Maid Simply Orange Juice; Suave Shampoo or Conditioner; Hannaford Dry Roasted Peanuts; Hannaford Peanut Butter; Kelloggs Raisin Bran Cereal; my essentials Pasta; Rice-A-Roni or Pasta Roni; Heinz Tomato Ketchup; BelGioioso Fresh Mozzarella Ball; and more. Find all deals and offers in the latest Hannaford Flyer for your local store.